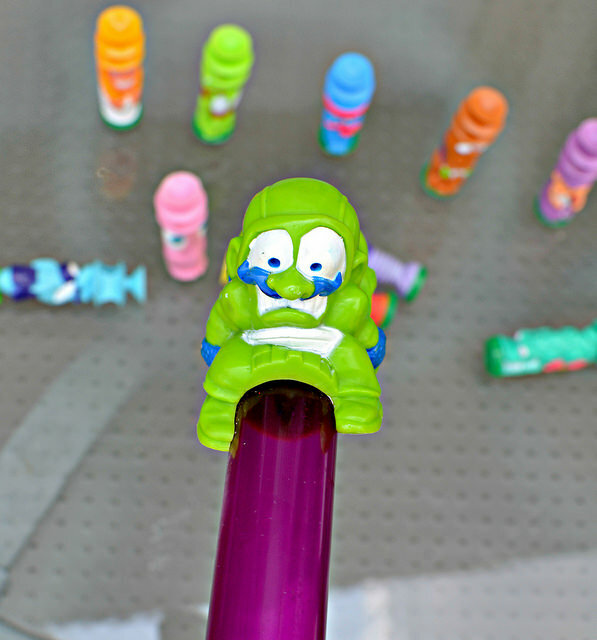 This is a follow-up post to a previous Little Weirdos post on the Suckers toy line. One of the reasons I love toys from the 1980s so much is the fact that during that decade there were a lot of smaller companies and obscure releases that got retail shelf space, and these were often some of the coolest and weirdest toys. One such company was LJN, which you might know as the ones behind such questionable NES video game "classics" as "Friday the 13th" and "Jaws," as well as figure lines like E.T., Gremlins, Advanced Dungeons & Dragons, and Wrestling Superstars. One of the best LJN releases, though, also happens to be one of the most obscure. I'm talking about the Suckers! line from 1987. 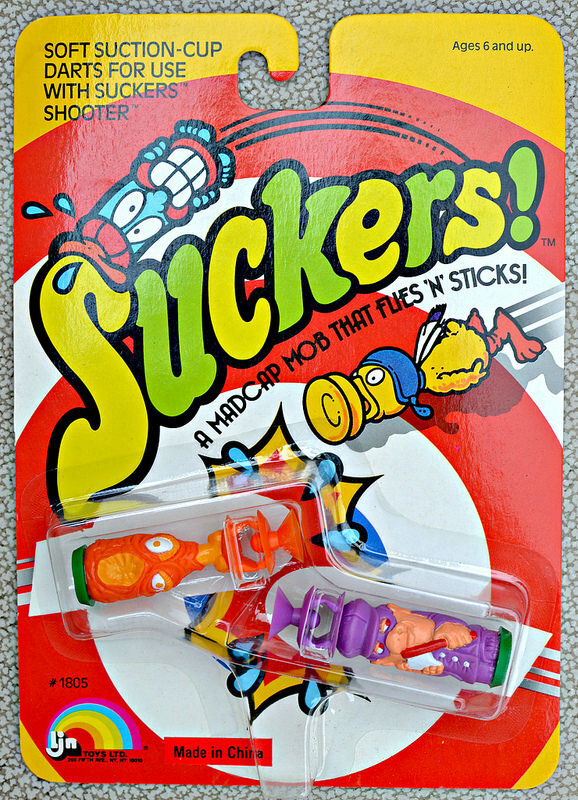 Suckers! was based on a simple concept that's been done many times in the toy world: a blow gun that kids could shoot suction cup darts from. What made it different, though, is that the darts in the line weren't just any old boring darts--they were in the form of mini figures depicting monsters and other bizarro characters. The soft plastic darts were so cool and well-sculpted that they were worth collecting even if you didn't have the Suckers! blow gun to use them with. 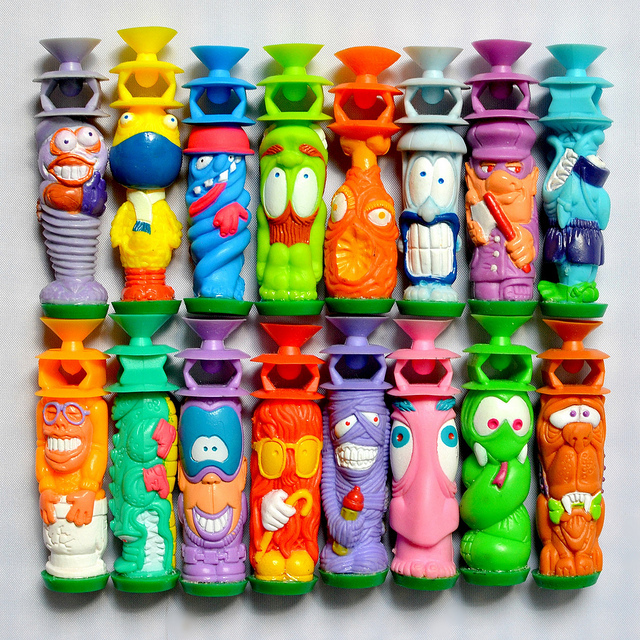 They were a perfect addition to the golden era of weirdo toys like Madballs and Garbage Pail Kids. To date, I have seen a total of 16 different Suckers! figures. 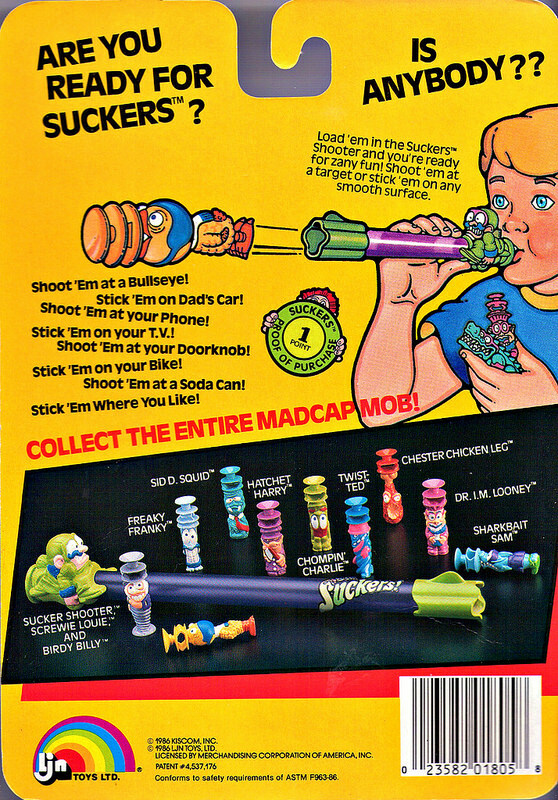 Two of them came exclusively with the "Sucker Shooter" blow gun, while the rest were sold separately, with two characters per package. The back of the Suckers! packaging shows 10 different figures. Strangely, two of the characters shown (Sid D. Squid and Dr. I.M. Looney) I've never actually owned or seen available online. Recently, some people have opened full cases of old store stock and those figures weren't in the boxes, which leads me to believe they were never released. Instead, the boxes contained two additional characters not shown on the packaging--a crazy-looking guy in yellow coming out of a toilet bowl and a turquoise alligator wearing shoes. Adding to the mystery is the fact that ever since I was a kid I've owned even more characters not shown on the package. This includes the last six figures of the bottom row in the top photo above (a bandit, a Cousin Itt-like character, a mummy, a giant nose creature, a snake, and a dog). I've never seen these six figures anywhere else, and I can't remember if the packaging was any different for these sculpts when I got them from Toys R Us back in the late '80s. They weren't included in the cases of old store stock recently found, either, so perhaps they were from a later-released Series 2. I'd like to know if there are any more sculpts out there. Below are a couple shots of Suckers! packaging, front and back. I love the artwork and the words on the back ("Are you ready for Suckers? ", "Stick 'em on Dad's car!"). I think crazy, wonderfully garish toy packaging like this is definitely a lost art. I've always been partial to Chester Chicken Leg (I mean, he's a chicken leg monster, for cryin' out loud! ), but I really like them all. There was a lot of creativity that went into the designs, and the wide range of textures and bright colors is just so appealing. What about you? 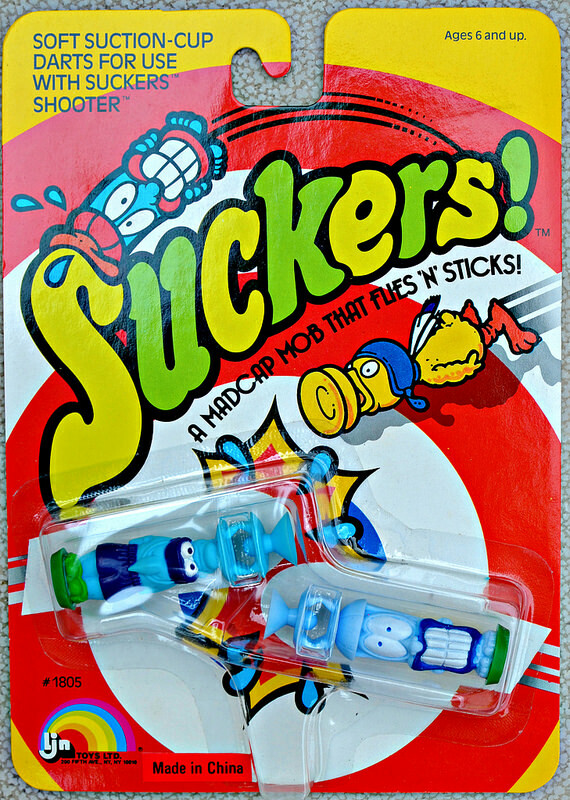 Did/do you have any Suckers!, or remember seeing them in stores? What do you think of them? Have you seen any other characters in addition to the ones pictured here? Let me know your thoughts in the comments! Never had or seen these to be honest but they are pretty interesting. Seems like most people are unaware of them. There's hardly anything else about them online. As a kid, I only remember seeing them at Toys R Us so I'm not sure how widely available they were. These were probably sold at K-Mart. Personally, I have memories of getting Food Fighters, Battle Beasts and Army Ants at K-Mart, and Suckers, Germs and Weird Ball Wrestlers at TRU. I wish I could go back in time and buy up a ton of all of it!